Many of the questions below can be answered by checking out Our 1 day Working Flair Seminar page. For questions related to our Commercial Bartending Course, check out the answers to all of those bartending course questions here. This FAQ’s page though is a great opportunity to capture those important details again. We have grouped related questions into a few categories for easy navigation. A pen for writing notes is all you really need to bring. We recommend you wear closed toed shoes, not flip flops or sandals. How often do you run your Working Flair Seminar? We run our flair classes about once every 6-8 weeks. Check out our current class options for all upcoming dates. What materials are included with your 4-hour Working Flair Seminar? One Flairco flair bottle (with lifetime warranty). Tips on how to make money even when handing over free glasses of water! How many people will be attending your Working Flair Seminar? We aim to keep the class size limited to 8 students. The Fine Art Bartending location only has so much room and each student needs enough space to practice the moves. 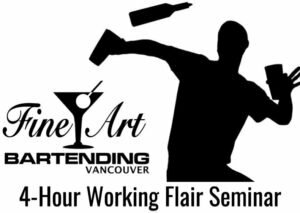 Do I have to be a graduate of Fine Art Bartending School to attend your Flair Seminar? No, we have usually have a good mix of Fine Art grads, and bartenders from various bars and restaurants looking to upgrading their skills. Do I need to be an experienced Bartender to attend your Working Flair Seminar? No, we have had several people come through the seminar just for fun. We have even trained a group of Starbucks Baristas looking to put some more fun into their work. Anyone is welcome. Will attending the Working Flair Seminar help me land a better job? Many bars & catering companies love to see you took an interest in your profession & upgraded your skill-set. There bars all over the world that only hire flair bartenders. Many accomplished flair bartenders will tell you they got better jobs, and made more money because they had that extra skill. What are the benefits of adding Working Flair to my Bartending skill set? Even very basic Working Flair is a great conversation starter with guests, and increased interaction with customers will always increase your tips. Having that extra skill set will help you stand out from the crowd, and you will create better opportunities for advancement for yourself. What is the benefit in attending a live hands on a flair seminar over purchasing training DVD’s, or YouTube? At our live hands-on flair class, our very experienced instructor will spot and correct any mistakes you may be making. Without that feedback, bad habits form and prevent you from mastering a move. You will master more moves and sequences much quicker than trying to figure out what you are doing wrong alone in front of an YouTube video. What is the difference between the Competition Flair Bartending I see on The Food Network & YouTube vs. Working Flair Bartending? Competition flair is very entertaining to watch at a live competition, or on TV, but not practical in all working environments. It isn’t often you have the 4 exact bottles with less than 3 ounces of juice in them needed to pull off a crazy competition flair move behind a real working bar. Our focus at Fine Art Bartending is on Working Flair. We teach you how to mix tricks in evenly throughout the night, so you never need to slow down. To be a successful working flair bartender you must always be entertaining to watch. If you are interested in pursuing Competition Flair in the future, the best way to create a solid foundation to build upon is to start with our Working Flair Bartending Seminar. If you have a question that we haven’t answered here, be sure to send us an email at [email protected] or give us a call. We are always eager to chat about all things bartending. Again, if your questions are related to our Bartender Certification Course… see all our frequently asked questions here.